Typical experiences of people who have restless leg syndrome are an uncontrollable urge to move the legs, a “twitchy” feeling like something is crawling on or inside your legs and it seems to affect people age 40 and older a lot more than those of younger age. Stefan surprised me with this topic…the first episode in a new series we’re trying out for Mobility Mastery Monday: Pop Q&A! I have no idea what he’ll ask me before we start filming these episodes, and we just take it from there. What if restless leg syndrome could go away fast? Why does it seem so mysterious to modern science and the medical community? What the heck is restless leg syndrome anyway? I am NOT a doctor, and this isn’t intended as medical advice, nor is it meant to diagnose or cure anyone. I offer some of my experience and opinions. What if your legs are simply twitchy and restless? What if there’s a reason for this? What if you could get relief today? Watch the video above, and then please share and comment! 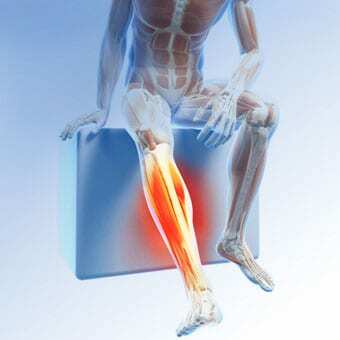 If you have restless leg syndrome and want to find out if fascial release can help, my top recommendations are releasing your hamstring and calf fascia. Please share this post if you know anyone struggling with restless leg syndrome, and if you have comments or questions drop them below! If you enjoyed this new version of Q&A Monday and have a question that you’d like us to feature and me to answer, please send your questions to stefancox@mobilitymastery.com so he can surprise me with them. Hi Elisha, I have test leds legs syndrome for 20 years. I have chronic plantar fasciitis 2 years these . No pain relief works for me. So many people in UK are suffering with no answers or help. I have tried Neurolink recently no effect at all. When you say you have fixed your mum what did you do ??? I’m sorry to hear you’re in pain! The two areas that helped eliminate restless leg syndrome for my mom and my cousin were calves and hamstrings. You can search my blog for self-help techniques for those areas. If I were working on you myself, we’d target your entire lower body for fascial release. I suspect the adductors could play a role as well. I am based out of Colorado in the US, but about to be totally mobile and traveling this summer while we work on a new membership site for Mobility Mastery that will teach you the basic techniques of Kinetix – the work I do in person – plus a lot of other stuff. So stay tuned for that! Kinetix is far more effective than self help.